Mikoto has a memory-dream of herself as a kid with a doctor, being shown someone struggling with muscular dystrophy. As such, she’s convinced to share her DNA so that medical science can find a cure. 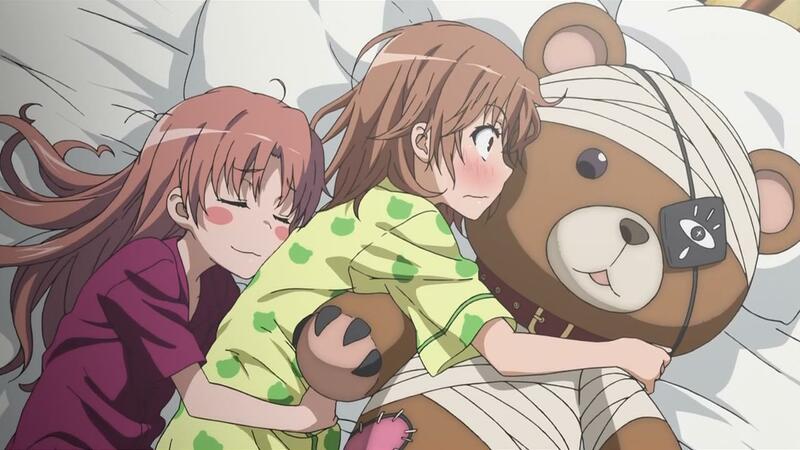 Mikoto wakes, spooning her giant teddy bear, but discovers she’s being spooned by Kuroko. After punishing Kuroko for her perverted actions, the two head out. 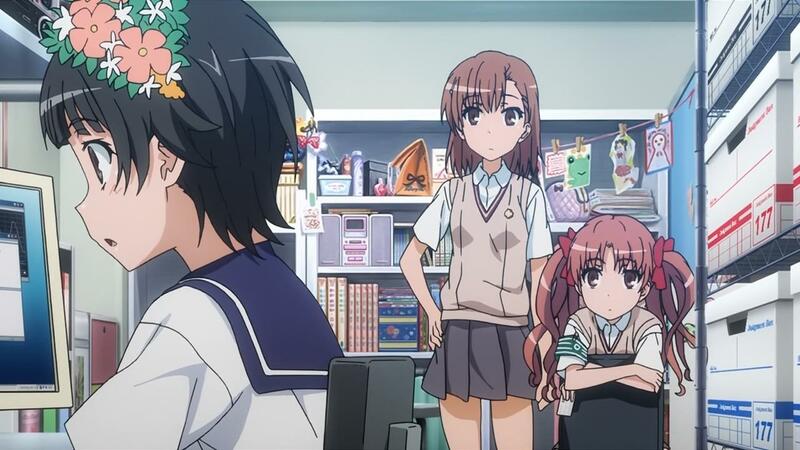 Mikoto wants to buy some supplies for a forthcoming school trip, leading Kuroko to verbally wish that Mikoto not buy more kiddie stuff. A look from the irritated Mikoto shuts Kuroko up. 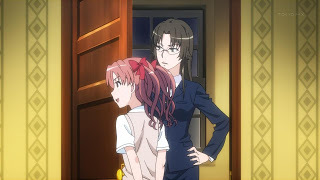 Kuroko suggests they take a shortcut she knows through the narrow allies between buildings, having memorized them through her work with Judgement. 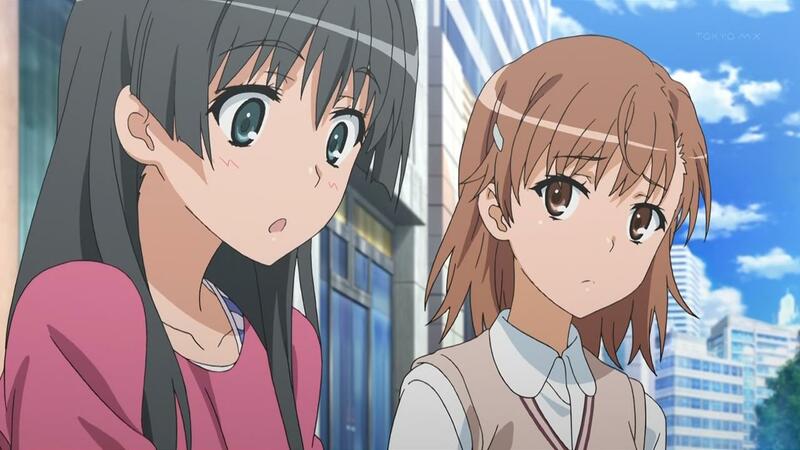 Kuroko says that no one uses these, but to her surprise, they encounter many people, including a fat guy, forcing Kuroko to teleport herself and Mikoto around him. 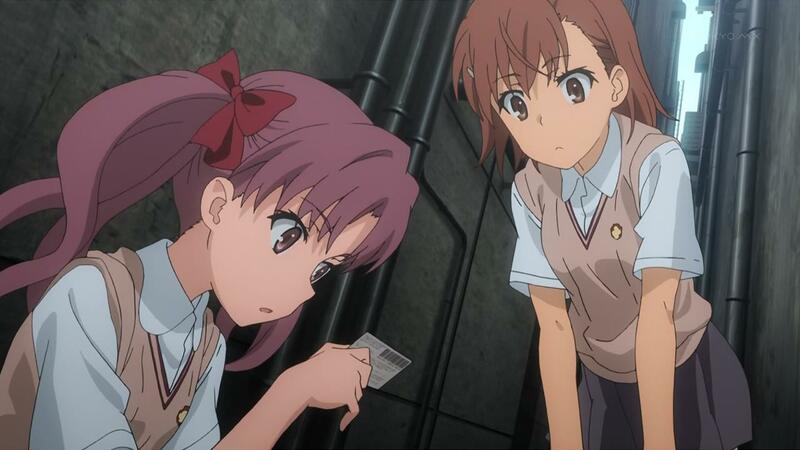 Kuroko finds an envelope with a money card inside. 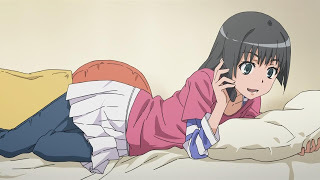 Bringing it to her Judgement office, Uiharu says that there are quite a large number or reports of people finding these cards, so Kuroko gets stuck to help with this case while Mikoto heads out again to do her shopping. On the way, Mikoto encounters Saten, who sniffing around, having found multiple envelops with money cards inside. 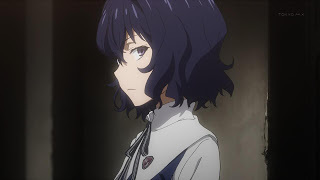 She takes Mikoto to find more, asking Mikoto why Mikoto ignored her earlier. Mikoto says it couldn’t have been her since she was with Kuroko all day. It is now early evening when Mikoto and Saten part company, Saten promising to turn the cards she and Mikoto found over to Uiharu, when Mikoto becomes aware of some Skill-Out thugs who’ve apparently discovered the identity of the person who’s been depositing the cards all over the alleyways. 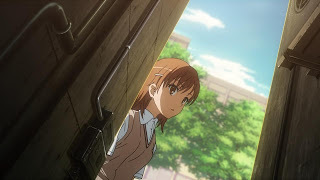 Mikoto trails them to an abandoned building, where the thugs encounter a girl in a high school uniform all alone in a room. They demand that she hand over the goods, and are not pleased when a search of her bag only reveals two money cards. Noting her calm demeanor, the thugs wonder if she’s an esper. 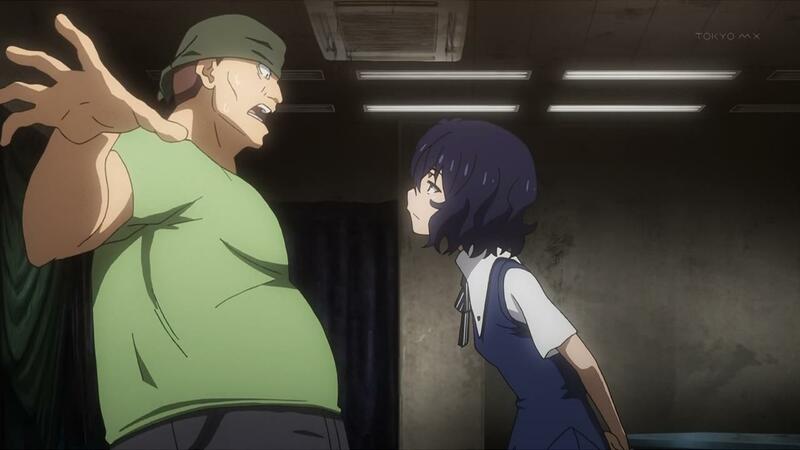 They leave her with one thug, who realizes she’s from Nagatenjouki Academy. She’s able to take out her guard, causing the other thugs to return. Methodically, she takes them out one by one with her power, called Critical, until the leader is left. She toys with him by killing the lights, but takes him out as well. 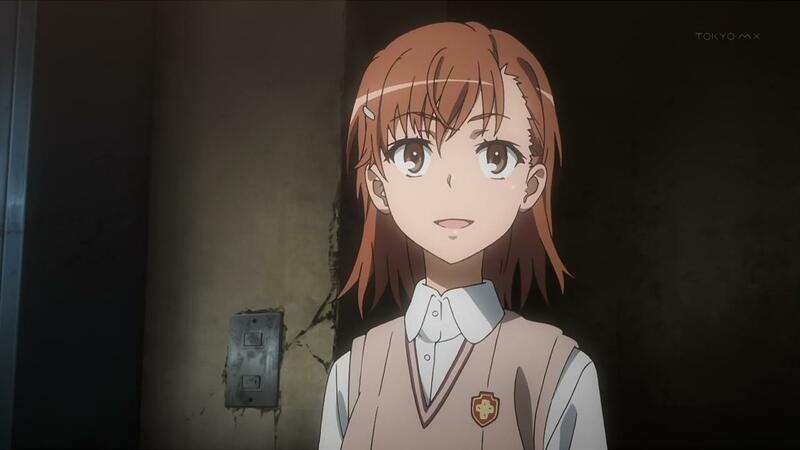 When she turns the lights back on, Mikoto is there, applauding the girl’s work. 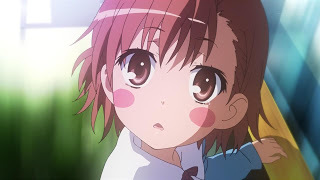 The girl looks at Mikoto and realizes she’s the original. Well, we officially start the Sister’s arc, and I for one am pretty glad. The preview for this episode made me think we were going to get another filler episode, but thankfully, that was not the case. It appears that for now, like the previous Railgun anime, this anime series is adapting the original manga story, then giving the story more elements to fill the corners. So, while this episode only covered chapter 18 of volume 4 in the manga, I never felt like things were padded with filler. Shinobu gets introduced here. One thing I missed in the original manga is that a younger Shinobu was at the same hospital that Mikoto visited when they played on her emotions to gain access to her DNA. The anime does what an anime adaptation should do, in this case making a point of revealing that it was Shinobu in the one shot frame from the manga. I also liked that this episode went further in revealing the tricks to Shinobu’s Critical ability, which may have a psychic element to it, but is more about fooling people. Also, Seven Seas really didn’t make it clear that Shinobu would speak English at times. The simple font change they used was not enough to convey that message. So, learning this made an interesting addition to Shinobu’s character.